Consolidation crept into the Indian Markets on expected lines. The second half of the session took a volatile turn as the NIFTY pared nearly 90-points from the high point of the day. Though some recovery was seen, the benchmark index ended the day losing 22.50 points or 0.21%. The consolidation that we saw creeping in is likely to persist on Thursday as well. As we go into the trade on Thursday, we expect a quiet start to the trade. 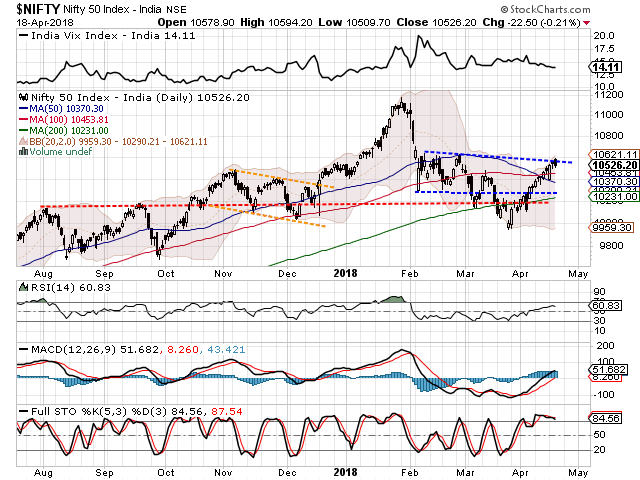 The zones of 10570-10590 will continue to act immediate resistance for the Markets. However, this being said, looking at the F&O data, the consolidation that we are expecting is not likely to last long. Despite some volatility, it is also likely to have limited downsides. We see the area of 10570 and 10610 acting as immediate resistance area for the Markets. Supports come in at 10480 and 10450 levels. The Relative Strength Index – RSI on the Daily Chart is 60.83 and it remains neutral showing no divergence to the price. The Daily MACD stays bullish while trading above its signal line. No significant formations were seen on Candles. Pattern analysis suggests that the NIFTY resisted at the upper range of the broad rectangle formation that was created. Currently, we expect this resistance area to hold and we expect some consolidation taking place in a ranged movement on either side. Overall, even after nine days of gain, the NIFTY not registering any major loss is a sign of underlying strength. However, given the present structure of the Markets on the Daily Charts, some consolidation is very much imminent. We expect Thursday’s session to remain range bound. Volatility is likely to continue to persist but downsides, if any, will remain limited. We reiterate maintaining stock specific approach for Thursday. Volatility should be used to make select purchases while continuing to protect profits at higher levels. Favorable technical setup is observed in BHARTI AIRTEL, IDFC, ZEE ENTERTAINMENT, M&M FINANCIAL, AMARA RAJA BATTARIES, GREAVES COTTON, ROLTA INDIA, THOMAS COOK, GODREJ INDUSTRIES and COLGATE PALMOLIVE.